Keeping a clean house isn’t just important to many elderly people, it is mandatory. They grew up in a generation where women were judged based on the cleanliness of their home. Right or wrong, it’s a fact. However, as they age, become weaker, and even begin to lose mobility, it seems that housekeeping becomes harder and harder. This often leads to a sense of failure and embarrassment, but with the proper tools, elderly people can still take care of their daily tasks. One such tool to consider is the vacuum cleaner. Most are too heavy and clunky to be functional for senior, however, that doesn’t mean that there aren’t any options out there. Here is your definitive guide on how to find the best lightweight vacuum cleaners for elderly people. In a hurry? Here are my recommended easy to push vacuum cleaners for seniors. Or, if you want to learn all about how to shop for a vacuum cleaner yourself, keep on reading. A vacuum is a critical part of keeping a home clean. Shopping for a vacuum cleaner for an elderly person is different than what you may think because there are many factors to consider depending on the elderly person’s needs and abilities, It will also be important to take into account future needs if their abilities are decreasing. The vacuum cleaner an elderly person needs is much different from one that a younger, healthier person might choose. Safety while using a vacuum must be taken into account as well. Here are the important features to consider for a senior. 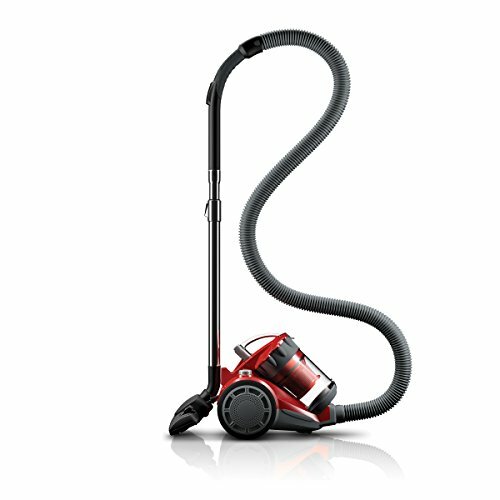 Which Type of Vacuum Cleaner is Best? The type of cleaner is the first important consideration for the elderly. Is an upright vacuum, a canister style, or one of the stick cleaners the best for them? Canister vacuums should probably be ruled out for most elderly people. Canister vacuums are much heavier than other vacuum cleaners. The hose and canister section that drags behind are also trip hazards and could be dangerous. Stick type of vacuums are the lightest vacuum options in terms of weight, so they can be good choices for the elderly in terms of handling. But many of these machines lack good suction for a thorough cleaning. The weight of the vacuum cleaner is a very important factor. Weights of vacuum cleaners vary greatly from type to type and from model to model. As discussed above, canister vacuums tend to be the heaviest, followed by upright vacuums, then stick models. For elderly people, the lighter the vacuum, the better. But, the weight must also be balanced with the suction power of the unit. Many of the extremely lightweight models lack suction as compared to their heavier counterparts. Look for a model that is a weight the elderly person can manage while also doing the job needed. Also make sure it’s an easy to push vacuum cleaner. It’s one thing if the unit itself overall is lightweight, but is it light enough for the senior to push around their house? Double check and make sure they can easily maneuver the vacuum. Plug In or Should You Go Cordless? 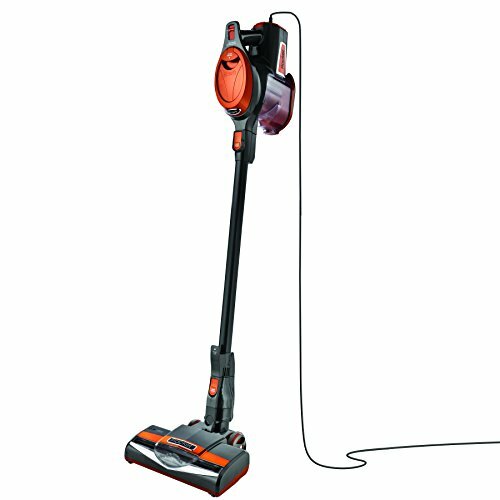 Vacuums offer several power options but the most popular are ones with rechargeable batteries and AC powered (plug-in style). The ones that plug into the wall generally offer more powerful motors. Battery powered models though may be safer because there is no power cord to trip over. The challenge here is to balance power with safety. While on the subject of power type, the location of the on/off switch should be considered. Some vacuums turn on with foot switches and some use hand switches. If the elderly person has arthritic hands or painful joints, the foot switch is sometimes the best choice, However, there are models that have easy to use hand switches. On the other hand, if there are foot problems or deformities, the hand-operated switch is the best choice. This is an important factor that many people may not have considered. Is a Retractable Cord Important? Some vacuums come with a cord that is automatically wound back into the machine at the press of a button. This can be very helpful to an elderly person – especially one with a balance problem. The up and down, back and forth motion required to wrap a cord on a vacuum can be difficult – if not dangerous – for some elderly people. Let a Self-Propel Vacuum Do (Most) of the Work! Some vacuums even have an automatic drive system that helps propel the vacuum forward and backward. This can be very helpful to a senior who is weak and finds pushing a vacuum on carpet difficult. I would advise against this option though if there are balance problems to think about. The vacuum could pull away too quickly and cause a fall if the elderly person cannot react quick enough. We all know that vacuums lose efficiency as their bag gets fuller. Once a bag is completely full, the cleaner can lose all suction and look like it isn’t working. Keep running a vacuum with a full bag, and it could burst causing a huge mess. So, having a “bag full indicator” light could help a forgetful senior know when to change the bag. This will keep the vacuum running at its best and could prevent a mess too! Is a Light on the Front Necessary? Having a light on the front of the vacuum could be a handy feature. Especially for a person with failing eyesight or bad vision. This may help them see lint and dirt on the carpet that they might have missed. This would also be a benefit if their house is poorly lit. Not mandatory, but a nice feature to have. This issue is the great debate among everyone shopping for a vacuum cleaner – elderly or not! Each style has advantages and disadvantages. I am not going to get into great detail about that here. I’d rather look at this issue at it applies to the elderly. If you want to look into this subject more, here is a detailed article about bagged vs bagless vacuums. Generally, bagless vacuums are cheaper to use because you don’t have to continually buy a supply of bags. However, they are also a little dirtier because the dirt collection canister must be regularly dumped, which can be a dirty process. Also, most bagless vacuums require the purchase and cleaning of HEPA filters too. Bagged vacuums generally cost more than their bagless counterparts because bags must be purchased as they are emptied. They are a little cleaner though because (most) of the dirt stays in the bag, and the entire bag gets thrown away when you’re finished. As you can see, it’s easy to go either way on this issue depending on your preferences and priorities. However, for seniors, there are a few more factors to consider. Here is my take on bagged vs bagless vacuums as it applies to elderly. If the vacuum will be maintained by the elderly person, I recommend a good ‘ole cleaner with a bag. In most cases, this is what they are used to anyway. So, bagless might not be the easiest or most prudent option for elderly folks looking for a vacuum cleaner. Putting the vacuum back together after emptying the canister or cleaning is the most difficult part. If the parts aren’t lined up correctly or the rubber seals aren’t put back in the right place, the cleaner will not work as well. A bag is easier to install in a vacuum. It usually just requires fitting the bag over the suction tube. If you want a bagless model, look for one that takes the fewest steps to empty. The following features aren’t a major factor in terms of the safety of a vacuum for the elderly, but most of these are convenient to have and will make using the vacuum a better experience for an elderly person. Agitator beater bar – This the rotating black bar with the little brushes at the front of a vacuum. It spins quickly to beat dust and lint off of the carpet for better cleaning. It is standard equipment now on most vacuum cleaners. Edge cleaner – This is a feature that allows a vacuum to clean all the way to the edge of a wall without any dead spots at the ends. This just makes the cleaner more efficient and could help clean areas the elderly person may miss. Pet hair feature – These are usually special features or cleaning heads that are designed specifically for picking up pet hair, which is obviously a nice feature for seniors with pets. 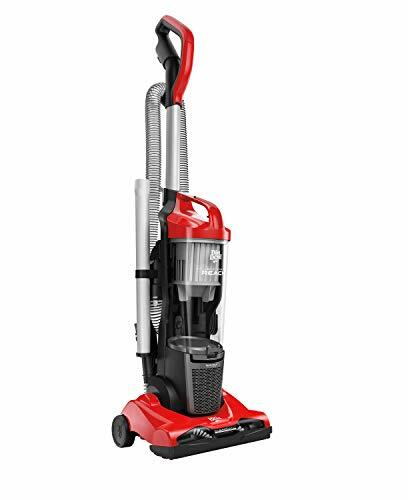 Adjustable height levels – This allows the vacuum’s height to be adjusted based on the thickness of the carpet, so the cleaner can run more efficiently depending on the floor surface. This setting is usually a standard feature. Often, this feature includes a setting for bare floors which keeps the cleaner from spitting dirt out the back. Many elderly people may not use this feature though because it typically requires bending over. This is difficult for elderly with balance or back problems. Accessories and tools – Onboard tools such as crevice and upholstery tools are also nice to have for a thorough cleaning. It is important to know whether or not the senior can safely use features like this, though. It could also be difficult for arthritic hands to attach and detach accessories. Here are more detailed reviews for each product that I have recommended. While this vacuum cleaner does not have everything I recommend for the elderly, it does have most of it. The vacuum is a little heavier than some of the others but the self-propelled feature more than makes up for it. The self-propelled drive is operated when pressure is put on the handle. It even senses push and pull motion and changes the direction automatically. The weight will really only be an issue if there is a reason to pick it up and carry it. I also like the location of the power switch on this one. It is located right on the handle and can easily be pushed with the thumb while using the vacuum. If there are arthritis problems or other joint issues, it can be moved with other fingers or even the palm. What this vacuum lacks in features, it excels in usability for the elderly and seniors. It is the perfect combination of lightweight build and power. 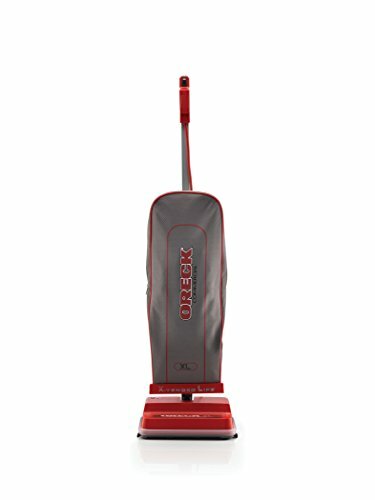 Oreck has a great reputation for making quality vacuum cleaners. This model has commercial grade motors and only weighs 8 pounds, so it is light, nimble, and easy to maneuver. The Arthritis Foundation has even recognized this vacuum due to its easy to use ergonomic handle. This is the best lightweight vacuum cleaner for elderly with balance problems. The hooks for storing the power cord are up high, so this means less bending over for the elderly person. Another ease of use feature is the vacuum automatically adjusts to the flooring level – this also means no bending over to adjust the cleaner during use. Even the power switch is easy to use and is located high on the handle. Swivel Steering. Excellent control for maneuvering around furniture. The SharkNinja Rocket vacuum is a multi-functional cleaner that is also extremely lightweight and easy to use. 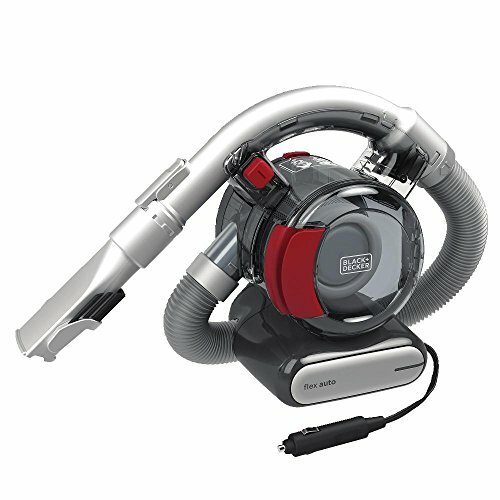 Right out of the box, it acts like an upright vacuum cleaner and converts quickly to a hand vac by popping off the extension and vacuum head. This is done with a single button, so it’s very easy to operate. The entire unit weighs 7.8 lbs while the hand vac only weighs right at 3 lbs. 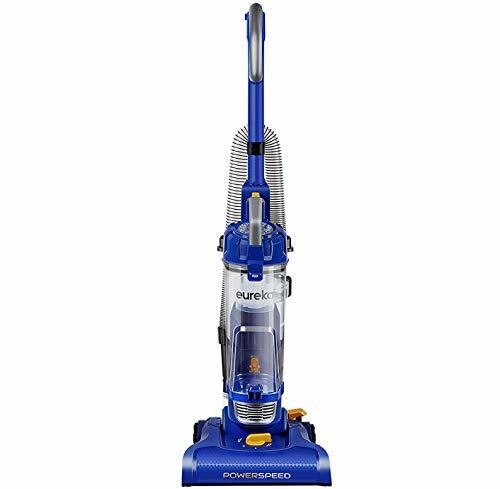 For those who don’t want to spend a ton of money but want a decent vacuum, I recommend this one because it is very light and easy to push and maneuver. The bag is easy to change and can be purchased anywhere that sells bags. It also has good power and cleans well too. All of the basic accessories are included as well, and it’s not too expensive either. Of course, because this is a budget product, it doesn’t have some of the features I would prefer. The on/off switch is located at the bottom, although it works easily with the foot. The cord will also be more difficult for someone with arthritis to handle and wind back up. Don’t forget about a vacuum for your car as well! Seniors will enjoy this particular car vacuum because it is very easy to operate. The button doesn’t have to be held down continually while operating, unlike most other car vacuums. It’s also very lightweight. These two features make this device great for seniors because it won’t inflame any sort of arthritis or other pain in the hands. In addition to those features, the 12 Volt power source adapter of this car vacuum is a simple cigarette lighter. No messing with portable power sources or trying to find an outdoor power outlet with this car vacuum. 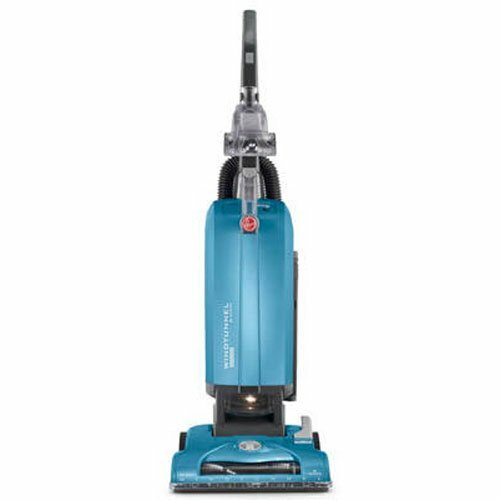 What’s my Top Pick of Lightweight Vacuum Cleaners for the Elderly? OK, so if you pinned me down and made me give you an overall best pick, it would have to be the – hands down! It has nearly every feature I look for, and it is so lightweight and extremely simple to use too. So, do you have a vacuum cleaner you recommend for seniors or the elderly? Is there a particular product you like to use? Let me and my readers know in the comments below! Also, please share this on your favorite social accounts if you found it helpful!